We’ll be serving up a whole different lot this week, and veggie spaghetti makes the list this week. I have 2 varieties of veggie spaghetti, jumbos and small wonders. Vegetable spaghetti is my all time favorite vegetable. My boys love it, it’s easy to prepare and very versatile, not to mention a healthy alternative to pasta for those that can’t have gluten or simple carbs. We also have a bunch of fruit coming on too! You will see an increase in fruit for a while, so those that have a sweet tooth, this is your week. Slice the squash in half lengthwise, or from stem to blossom end. Spoon out the seeds. You can cook vegetable spaghetti in the microwave on high for 5 minutes per pound, or roast in the oven for 30 minutes per pound at 350 degrees. Take a fork and scrape the inside flesh. It will come out in long thin strands like spaghetti noodles. 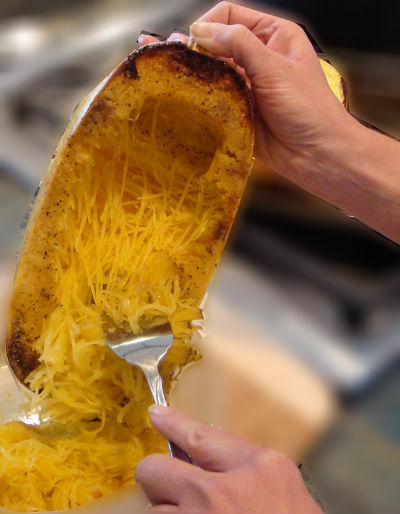 When we eat veggie spaghetti, I put the sauce or pesto inside the squash halves and we just eat from the squash. This makes clean up really easy! You can use the basil this week to make pesto spaghetti for a nice meal. This is a favorite family recipe that we serve at our family reunions. Enjoy it. In a skillet saute butter, cabbage, onions salt and pepper. In a separate sauce pan get some water boiling. Combine all ingredients for the dumplings and drop by small teaspoonfuls into the boiling water. Boil for about 2 minutes. Remove dumplings with a slotted spoon and add dumplings to he cabbage skillet. Serve hot. I will be going on Central PA live today for national lasagna day. I’ll be making a noodless vegetable lasagna with our zucchini, check it out if you get the chance! That definitely sounds like a dish from the old country. I have no idea how many generations have made it before me, but it’s nice to be able to keep these old traditions alive.